Fellow passengers described a “greate & fearful creaking of wood under-foot” as Alden walked about the Mayflower. 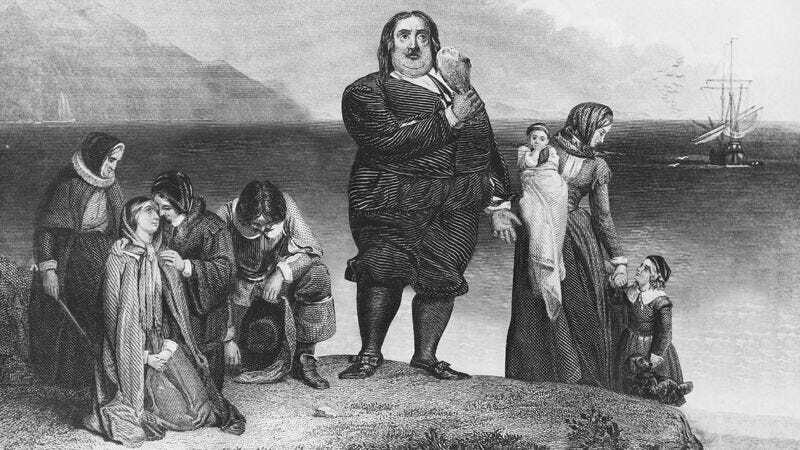 BOSTON—In a startling discovery that sheds new light on the link between the earliest American colonists and their modern descendants, researchers at Boston University announced Thursday they have traced the U.S. obesity epidemic back to a single heavyset Mayflower passenger. Through an exhaustive analysis of genetic samples, as well as diary entries, ship logs, and tattered medical records from the early 17th century, a multidisciplinary research team has reportedly determined that the majority of severely overweight individuals in the United States today share key genetic markers and unhealthy eating behaviors that appear to be passed down from a 307-pound Plymouth Colony settler named Jeremiah Alden. “We would certainly not have a situation in which 62 percent of the U.S. population is either overweight or obese had this man simply stayed in England,” he added. Noting that early American colonies were frequently plagued by starvation, researchers said Alden’s sheer caloric intake—a 17th-century journal claimed he “consum’d three-and-twenty biscuits every noonday”—allowed the separatist Puritan to thrive despite the odds, resulting in a selective genetic advantage. The study’s authors also confirmed that the United States’ high rates of Type 2 diabetes, hypertension, knee joint pain, and sleep apnea are almost solely a result of this one enormous man’s contributions to the gene pool. Researchers said they were first inspired to study Alden after reading several passages in William Bradford’s Of Plymouth Plantation, which described the settler as a “slothfull fellow who erupteth through his waistcoat with girth” and “labours hard for his breath, the swett allways upon his crimson-hued face.” Though he counted for only one of the Mayflower’s 102 passengers, logs kept during the voyage claimed he had “near devowered rations set a-side for one man’s intire voyage” before the ship had even left port in England, enraging his gaunt and scurvy-prone fellow travelers. Citing records that indicate Alden required “the skines of seven otters to cloathe wholy his great bodily expance,” the research team suggested that his excess reserves of adipose tissue allowed him—and the genes he would pass along—to survive until spring. Numerous artifacts provide further evidence of Alden’s rotundness, including a contemporary woodcut that depicts a nearly spherical man, the buckles on his doublet straining to contain his frame as he stands among a group of rail-thin Pilgrims and Native Americans. Additional documents also describe first Thanksgiving in 1621, at which, according to one account, this ancestral forerunner of U.S. obesity “did go back for double, treble, and quadreble servings” of wildfowl and maize. The researchers stressed, however, that their discovery of a single obese progenitor should not be used as a scapegoat by modern Americans for their poor dietary habits and dangerously high body masses.